Your condition is monitored throughout the surgery by your anesthesiologist. The atmosphere in the operating room can be daunting because there is a lot of equipment and sometimes a fair amount of noise from alarms or monitors and staff preparations. Staff are dressed in operative attire with masks and gowns. 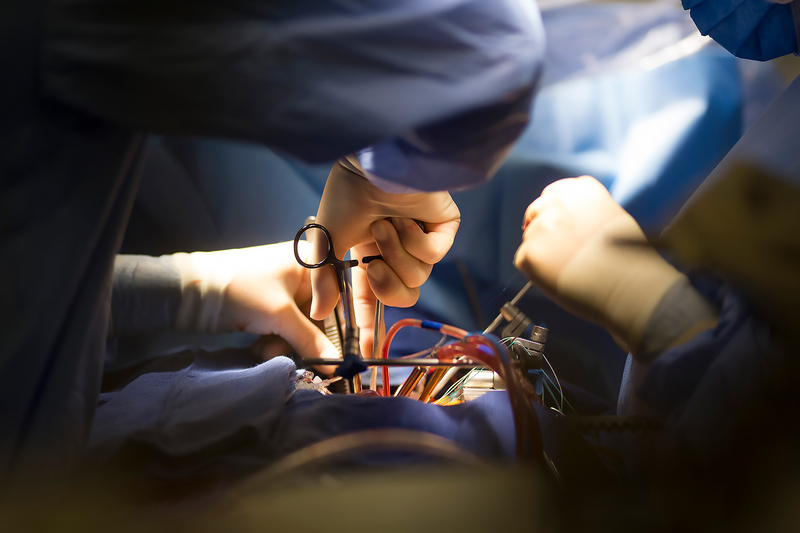 The operating room temperature may feel cold. Your anesthesiologist will give you an oxygen mask and place additional monitoring lines. While breathing oxygen, the anesthesiologist will administer an intravenous injection which will put you to sleep. You will remain asleep from this point until you wake up in the intensive care ward some hours after surgery. A tube is placed through your mouth to connect your lungs to a ventilator and additional monitoring lines are placed through veins in your neck. A urinary catheter is placed in your bladder. You will then be cleaned with antiseptic solution and then covered with drapes. The surgical team performing mitral valve repair surgery. The surgery then commences with the surgeon making an incision in the midline over your breast bone. The surgical team usually consists of two or three surgeons who perform varying parts of the operation as a team (similar to a pilot and copilot in an airplane). If you also require coronary bypass surgery, another surgeon or physician assistant (PA) may simultaneously make an incision in your leg to excise a segment of leg vein for the bypass. The breast bone is divided with a saw and the heart is exposed. The surgeon will place tubes into the blood vessels that emerge from the heart and connect you to a “heart-lung machine”. The heart-lung machine performs the function of the heart and lungs while the surgeon is operating on the heart. The surgeon then starts the heart-lung machine and then stops your heart using special drug infusions. Perfusionists operate and monitor the heart-lung machine during mitral valve repair surgery. With your heart stopped the surgeon can then open your heart and operate on the heart valves. The surgeon makes a cut into the appropriate chamber of the heart to expose the valve. The surgeons inspect the valve and then perform the repair or replacement as necessary. The surgeons also perform any other procedures you may require such as coronary bypass surgery or surgery to treat atrial fibrillation. Once your procedure is complete, the surgeon closes the incisions he has made in the heart and restarts the heart beating. The heart-lung machine is gradually weaned off and your heart resumes full function of pumping blood around your body and lungs. The surgeon then stops any bleeding and places chest drains through your skin which will drain any blood from around the heart when you return to the intensive care ward. He will also place temporary ‘pacing wires’ through the skin which are connected to a pacemaker to increase your heart rate if required. The surgeon then closes the chest incision using steel wires to approximate your breastbone and dissolving sutures to close the other layers of the wound.